books? I will answer that question and many others in this book. My new book 'EZDRAS INSIGHTS' also has many cross references to Bible scriptures and other Apocryphal books. There is also a lot of modern science in it, and brings out some amazing TRUTHS. Amazingly, this book accurately predicted the coming of the Messiah, stating that it would take 400 years in around 400 BCE. For Jewish viewers you will find this Jewish book very interesting, as it also talks about what happened to the 'MISSING 10 TRIBES OF ISRAEL'- A very mysterious passage which has implications for the LAST DAYS. II EZDRAS also alludes to the EARTH being HOLLOW in 5 of its chapters. My last book 'ENOCH INSIGHTS', based on the book of Enoch also stated that the earth is HOLLOW. I am currently working on two more Jewish Apocryphal books: The Book of Jasher and The book of Jubilees. These two books are much longer and are a big challenge. Guess what? These two books also allude to the earth being HOLLOW. The Bible itself also has some very strange verses which would also seem to indicate that the earth is indeed HOLLOW. WHY has God repeatedly told his prophets such as ENOCH and EZRA and others that the earth is in fact HOLLOW unless it is TRUE? In Talking with Jewish Sages, they told me that YES, their ancients always stated that the earth is indeed HOLLOW. See for yourselves by reading my NEW 'INSIGHTS' BOOKS both EZDRAS & ENOCH. 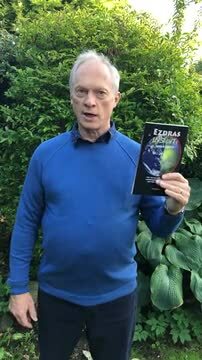 You ask if the Book of Ezdras II is INSPIRED and I am absolutely sure that it is inspired. As I said before, it was part of the Biblical Canon for almost 1900 years, and was in the King James bible until 1885. It is still in the Bible of the Orthodox churches today. The Book of Enoch as contained in my last book 'Enoch Insights' has been part of Biblical Canon, and is still in the 'Canon of the Ethiopian Christian church' to this day. That having said, both of these books are INVALUABLE, as they fill in the details to Biblical scriptures so well.